Bruce and I drove up to spend the weekend with Melissa and her boyfriend, Michael. We got a late start and didn't arrive in SA until late on Saturday, so we spent a cozy evening at home with the kids. Sunday morning we got up, had coffee, went to get bagels in our jammies (yes all of us, in our jammies). 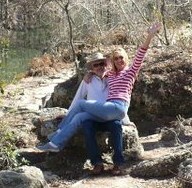 We then dressed and drove out to Hamilton Pool. It's been a while since we visited this beautiful natural wonder and Michael had never been there. We had a beautiful drive out on the winding roads that lead to this now public facility. You check in and if you have someone 55 or older in the car, everyone gets in for free! There are restrooms and information about the park provided. We opted for the pool first. Michael was fun to have along since this was all new to him. He is very interested in the natural wonders and stopped all along the way to take pictures and to peer at the rubble and rocks that litter the area just off the trail. 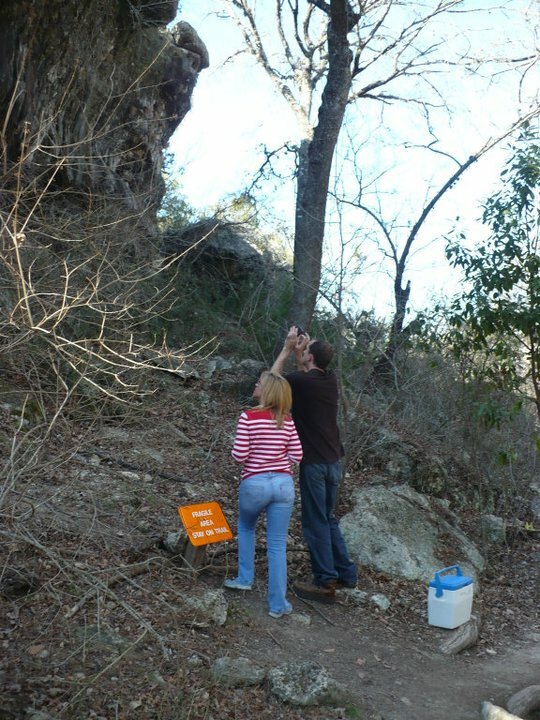 It's a protected natural site and visitors are urged to stay on the trails, but Michael is a bit of a rebel. We had to shoo him back to the trail proper more than once, and even had to stand aside and pretend not to know him as other hikers passed us on the trail. We made our way around the pool, first passing the falls that spatter continually on a limestone mound created by untold years of falling water. This is fun to stand upon in warmer weather when swimming is allowed. There was no restriction this day but it had begun quite a bit cooler and we were not prepared, nor inclined to test the waters. We trekked past the inner walls of this grotto, imagining Indian tribes that may have once found shelter or even made homes here. It's fascinating to find shells frozen in time within these layered walls. We stopped for a picnic about 3/4 of the way around. We made ourselves at home on the fallen rocks, hoping that today would not be the day that would see more falling pieces. It was such a serene and peaceful place to stop for a bite. We had eddies of swirling breeze making their way to us from above that made this spot simply delightful. We finished our bagel sandwiches and continued on past a cascade of slow moving seeping water falling from above, that forms a green wall of life. It's difficult to control oneself from reaching out to touch this lush green growth fed by the nutrient rich seeping groundwater from above. We left the shelter of the rock overhang, then took a short break on the white crescent "beach" for some photos. We then pressed onward for the more strenuous part of this little adventure. 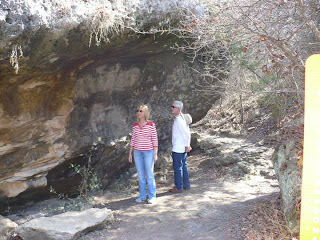 We hiked nearly a mile along the creek bed until we reached the Pedernales river. We took a breather while we stared at the beauty before us and watched a father and his small son enjoying themselves at the water's edge. All too soon, it was time for us to start back the way we had come. This part went a bit more quickly as we were more familiar with the trail. The last but not least strenuous part of the journey was waiting for us. We still had to climb our way back up to the ground level above. Remember, we had come down into the creek bed. I wish there was a way we could reverse it all so we wouldn't be all hot and winded at the end. The visit to Hamilton Pool was such a great way to get some exercise on this beautifully warm respite from winter. We enjoyed the Kid's company and it was a perfect break from routine. Everyone should check out this natural wonder. 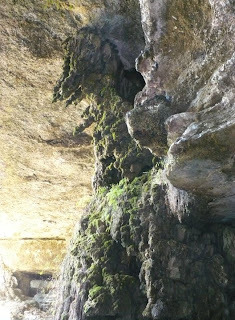 Here is a link with more information about Hamilton Pool in the Texas Hill Country. Enjoy!